When Nightmare neighbours attacked Armando Martins and bragged about their “achievements” to the TV cameras Toxic Lives petitioned the council, exposed the behavioural issues, and provided an advocation service. We say that attitude is victim blaming, a technique used to mask the true motivation for a complaint, which is usually attributable to the controlling behaviour of the assailant. The type of complaints amateurs encounter are easily refuted, however the malicious complainer can get lucky when councils respond out of ignorance, to the loudest shout. In Armando’s case his assailant managed to motivate several complainers in an act of bullying, known as mobbing, to voice a number of complaints, most of which were fabricated. The mobbing went unaddressed despite being listed by the council as anti-social behaviour – council staff joined in blocking his goals and blighting his life and satisfying the assailant(s) need for power. Being able to enjoy the use of your property is a human right and making malicious complaints is a criminal activity called Harassment. The National Planning Policy Framework focuses on the needs of the community for housing. At an individual level, the needs of radio users are simple; to be able to deploy their property – the antennas they buy or develop, on the property they own or rent. The Government Policy which rules the Planning Regime in the UK is the National Planning Policy Framework 2012. On 12th March 2018, the secretary of state for communities and planning announced a public consultation about a newly drafted version of this policy. (See link above). This ran from March to May 2018 and is now closed. The Armando Martins Campaign has consulted with the Radio Society of Great Britain over many of the issues he faced. We see eye to eye on a number of issues. The problem in a nutshell is, the current framework excludes amateur radio as an entity. Amateur Antenna experimenters have to apply the rules for housing extensions, conservatories, sheds and garages. This limits the height and size available to a particular “virtual box” dependent on the size of the property. Council workers dealing with radio amateurs have no knowledge about amateur radio and are expected to make planning decisions etc. Successive re-writes of this policy have eliminated the needs of radio amateurs – making life more and more difficult. It follows that to rectify this for the future, some improvements were needed to the policy, to improve relevance and define further the needs of radio amateurs. The campaign was able to contribute as an organisation to the final version of the National Planning Policy Framework 2018. It asked for several amendments and shared information with the RSGB who agreed the suitability of those relating to amateur radio and telecommunications. Firstly, where the draft states at Para 112 – Planning Policies and Decisions should support the expansion of electronic communications networks. We asked to insert – that these are usually regulated by OFCOM. By inserting this it would make it clear that amateur antenna developments would be included in planning policy. d) Applications for planning permission to install the masts often used by amateur radio operators, radio taxi firms and other private and commercial users, usually present few potential planning problems in terms of size and visual impact over a wide area and will not normally be of such a scale as to have a serious impact on local amenity. Such applicants will generally have less scope for using alternative sites or for sharing sites, and masts will often need to be located on the premises. By inserting this, it would help resolve issues where scale and amenity were being misquoted in order to resist planning applications. Where we don’t see eye to eye with RSGB has been in the field of abusive neighbours and nimbyism, There is a tendency for victim blaming here. Too often we hear you have to keep in with the neighbours and while we support that whole heartedly it is not appropriate to have to resort to bribery to avoid emotional abuse, as several amateurs have reported to us. Where neighbours have taken advantage of planning regulations to abuse us by making anonymous complaints for example. We therefore have also asked for the enforcement regulations to be centralised (one Policy for all areas), and gave feedback as to the requirement to have a system that could not be abused. The consultation ended on 8th May 2018 and we are now waiting to see if our effort had any impact. There’s a chance it may not. The revised policy as it stands is a welcome change and if all goes well, we will be able to close the campaign on the strength of it, having made all of our points. We asked RSGB to query the right to develop in the space above a property which was included in the policy. This entry was posted in The Armando Martins Campaign, Uncategorized on May 20, 2018 by admin. Where does Amateur and hobby Radio fit into our Community? Why are you publishing these Frequently Asked Questions about Amateur Radio? Is this FAQ only applicable to Amateur Radio? Who is the leading authority on planning matters related to Amateur Radio installations? Does the RSGB represent all radio amateurs? What are the benefits of Radio Hobbies to Health and Well-being? What do Radio Hams do in their Spare Time? What is that Wire or Antenna? Why does the antenna have to be so Large or Long? Why are there so many different antennas in your system? 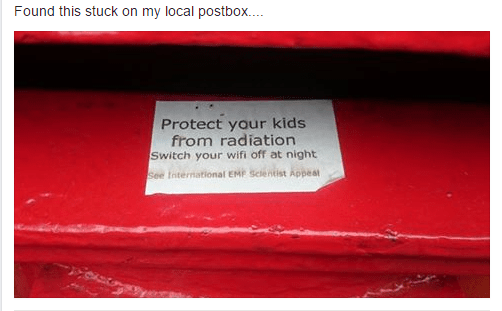 What type of radiation does the antenna give off? What power does an amateur radio station produce? Why does the antenna have to be so high? Can you do all that from a council house garden the size of a postage stamp? Do I have to put up with that eyesore in your Garden? Will it cause interference to my TV or Radio? Who do I call if I find my broadband, radio or TV is being interfered with? Will the council be able to help if I have a complaint? What can I do if I am approached by the council as a result of a complaint by a neighbour? What if I find my antenna subject to spurious or malicious complaints? Will my own devices, radio or TV interfere with an amateur radio station? Does Amateur or Hobby radio Transmissions Cause Cancer? What are the most common examples of Radio Transmitters in use in the UK? Do Amateur Radio or Hobby radios affect Cardiac Pacemakers? Is your antenna insured for public liability? Is your antenna system safe? Will your antenna system attract lightning? Other than planning law, do radio amateurs have to comply with any other regulations? What are the most common nuisances that can be attributed to amateur radio antenna? What forms of nuisance are suffered by radio amateurs? What planning process is applicable to amateur and hobby radio? Do I have to have my neighbours permission to put up an amateur radio or CB antenna? Do Radio Amateurs have a sense of Humour? According to the minister responsible for planning in the UK, Amateur Radio is a service much the same as your mobile phone, radio or TV service. He (or she) provides a planning service that allows for the sustainable development of communities and which is determined locally by the community. Nationally, it regulates building in communities, and this includes telecommunications and therefore amateur radio. Amateur radio has its own heritage, built up over a century or more by people in local communities. Professionally our armed services have relied heavily on developments by radio amateurs to win wars, and it has welcomed radio operators into service, who have been part of the amateur radio community. This is still relevant today. Amateur Radio gives people a choice to expand their knowledge of the world, develop skills and have some fun in their lives. As a hobby, it is practised for both professional and personal development (OFCOM) in many and diverse communities. In its basic form it involves learning how to operate a radio station and make contact between nations, at a community level (RSGB). People have practised amateur radio for over a century in the community and today there are 85,000 people in the UK qualified at various levels of proficiency. Its not all about radio, it can be about diversity, promoting community relations and physical and mental health (NHS). Amateur radio is often used to augment the emergency services communications at a community level, local events such as park runs may be controlled by radio amateurs for example leaving the police free to concentrate on other work. Radio amateurs exercise jointly with the local police and emergency planning departments. They provide much needed global and local communications during disasters and emergencies according to the united nations. Some people qualify to teach both young and older people to take up the hobby and radio amateurs often take part in local events and community projects to demonstrate the benefits and take pride in their achievements. Local clubs are organised. Recently when Astronaut Tim Peake was in orbit, the RSGB organised a number of events for schools throughout the country wishing to learn about technology and earth\space communications. The children were able to speak to Tim. This opportunity showcased the electronics and space industry encouraging children into the workforce as well as teaching them about how they can do it themselves from the community. This FAQ is for members of the public living close by to radio amateurs who may have questions about the installation of equipment around the property they occupy. It is also designed as a guideline for council workers dealing with complaints and for radio amateurs to consider when planning a system and dealing with neighbours. It is NOT intended to become the frequently asked questions on planning matters. No. Many Citizens in UK Encounter Toxic Neighbours when they set out to develop their property. According to Neighbourhood watch only 52% of neighbours share a desire to get on with their neighbours. Among the other 48% are a small number of people who get perverse pleasure from controlling their neighbours. Other forms of hobby radio are found in operation in the back yards of UK Citizens. This FAQ applies equally to those authorised by OFCOM, namely citizens band (CB) and private mobile radio aka PMR. 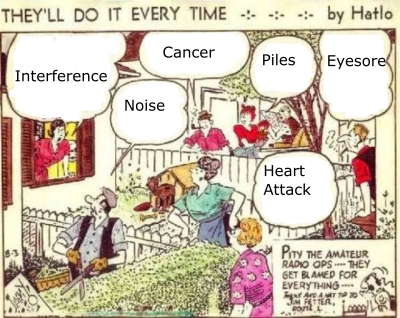 With thanks to an unknown artist this cartoon illustrates that neighbours may sometimes go to extreme lengths to discover what is going on in amateur radio stations in their community. The Radio Society of Great Britain (RSGB) is the authoritative source for all enquiries about planning matters and amateur radio antennas. No. Only members of the RSGB. It does not normally represent CB or PMR Users unless they have a radio amateurs licence and are a member. The Chief Medical Officer (NHS), Mind (the menal health charity) and NHS Mental Health Trusts all recommend taking up a hobby. This is especially important in later years. It will help you to manage loneliness and keep your mind and body fit and active. With radio hobbies you can generate a lot of fun and keep in touch with a community of like minded people who enjoy experimenting in radio, TV, satellite and data communications or just chatting. A few hours a day, spent in the company of others or building a radio project are likely to be very satisfying, produce regular contact with people and release more of the essential hormones into your brain, than any anti-depressant tablet. Radio sports are available and radio amateurs can keep physically fit by operating portable from hill top sites. There is always something new to learn or challenge to achieve. In UK Whatworkswellbeing.org are studying wellbeing in the community and workplace and provide additional resources on the topic. One facet of the hobby that many amateurs enjoy is building and testing antenna systems that give their station optimum performance. Radio Hams can operate in contests and gain certificates for the number of people or countries contacted etc. They really want to have the best radio station they can afford that keeps them in touch with their community of like minded people, and they mainly spend time comparing signals, sending data, (Text or video) voice and morse code transmissions around the world. As amateur radio is a service, he or she may be required to take part in disaster relief operations or assist the emergency services or red cross. As amateur radio is a self training service the radio amateur will be learning and teaching others or simply discussing the match or family matters. One British radio amateur kept the Falkland Islands Radio Station Live and gave a running commentary on the Argentinian invasion in 1982 – up until he was captured. To receive or transmit radio signals an antenna or antenna system is required. In domestic radio sets the antenna can be very simple and built into the set itself. To transmit a radio signal however requires an efficient antenna which can only perform well if it is constructed correctly. To perform correctly the parts of the antenna that radiate a signal must be the correct length for the frequency in use. As amateur radio uses radio waves of wavelength from 160m to a few centimetres in length, (divided up into a number of “bands” like the medium wave band or VHF Band). For transmitting, the antenna length is critical for any given frequency and it can be quite long. Each band requires a different antenna length. Some compromise antennas have been developed that are shorter and more compact however performance may be an issue for some when it comes to using a compromise antenna. Amateurs use Long, Medium and Short Waves. They also use Very High Frequency (VHF) and Ultra High Frequency (UHF) or 70cm. Some amateur VHF and UHF Antenna resemble domestic VHF FM radio and TV Antennas. The amateur experimenter will want to experiment with a variety of different antenna and radio sets which cover the frequencies he or she is interested in. CB’ers use fixed length antenna, limited by their code of practice, as do PMR users. Many designs are arranged to push (or radiate) the maximum signal in a given direction while radiating none in others. You may see such antenna being pointed in a particular direction by a device known as a rotator which is used to point it at the other radio station. These often resemble TV or domestic radio receiving antenna (which all point the same way – towards the TV transmitter). FM Domestic radio antenna often benefit from a rotator to point it at the required station. Its a way to receive the best signal for Hi-Fi enthusiasts. CB antenna are designed to limit the power being radiated to a very low level. In order to radiate or transmit a radio signal, an amateur has a choice of power levels usually ranging from low power, measured in milliwatts (which would light a torch bulb) and going up typically to one hundred watts – the same power as a household electric light bulb. Amateurs are trained to keep power levels down as a condition of their licence. Some amateur radio stations operate to legal limits of four hundred watts, for maximum performance. Safety is also a part of the amateur radio exam syllabus. Most amateur radio stations operate at power levels many times lower than those required to cause any harmful physiological effects – such as you would get from a nine hundred watt microwave oven if it was operated incorrectly for example. Many radio amateurs live long lives working and playing with radio waves and suffer no ill effects. CB Radios are designed to radiate limited, very low power levels in conjunction with a limited range of antennas so there is no danger that a CB or PMR radio will form a hazard and little chance it will interfere with other services like broadband and television sets (unless it is being operated illegally or misused). Antennas that are in the clear from surrounding objects have a better chance of radiating as much power as possible in the required direction. Sometimes signals are blocked by objects and the antenna is constructed to get the signal over any obstacles. Many amateur and CB radio operators operate from all sorts of properties ranging from flats and bungalows with small gardens, to medium sized properties in housing estates. Some amateurs are lucky enough to buy their properties with a reasonable amount of real estate to accommodate their antenna systems, located in the best position to maximise signals. The majority live in average size properties and design their antenna systems to take into account the space available. 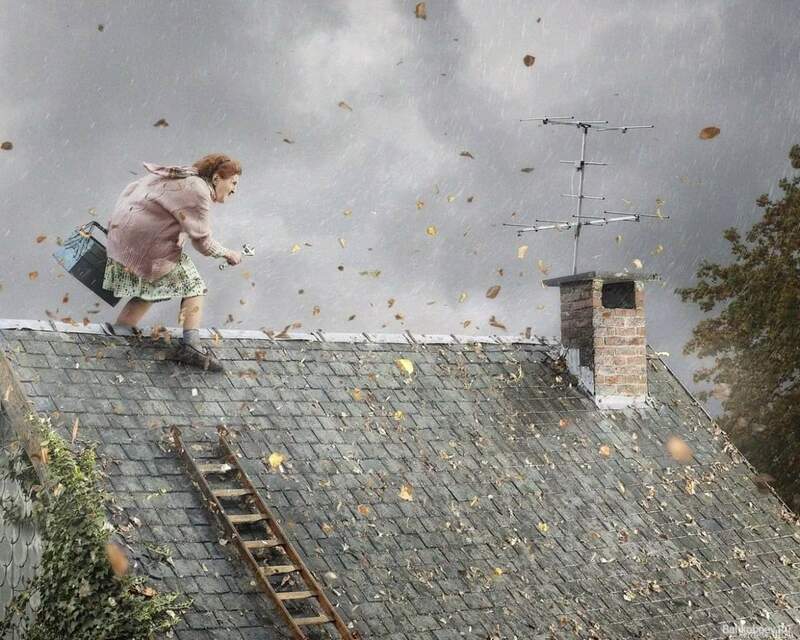 Others rely on the generosity of their neighbours, who usually help by making allowances, such as being able to spread the antenna out across neighbouring properties. Good neighbours are supportive in this respect and usually enjoy hearing what it’s about. Antennas at the lower end of the frequency range tend to be constructed of copper wire and usually these are laid horizontally the same as telegraph wires. As frequencies rise, the possibility to use copper, aluminium, wood and steel in the construction arises, giving a number of advantages. Radio amateurs generally buy commercial antenna equipment which is well designed and engineered. They realise that having structures to support the antenna in the garden is not “everybody’s cup of tea” but unless the property is in an area of outstanding natural beauty there will almost certainly be other radio masts nearby. There are always pylons, telegraph poles or street level mobile phone antennas in any district. These are allowed to exist under planning law. They support your mobile phone or electricity supply or personal communications (landline or Broadband). Most of these are in broad view at the front of our homes and earn revenue for their owners. Compared to these objects, most amateur radio antennas are located out of the public gaze, in our back gardens according to the minister for planning. Before labelling an amateur radio antenna an eyesore you should look around the local area. If it contains uncollected rubbish, dumped scrap vehicles or has any of the objects in this discussion then we think it only fair to review it in context. The average solar power installation or wind generator is much more visible than the average amateur radio antenna which can be designed to blend in at the rear of the property – unlike most solar installations. Most amateurs would view their antenna and any supporting structure required to position or hold it at the correct height as essential to their hobby and therefore their lives. They pride themselves in engineering (and camouflaging) the system and will happily “live and let live” with whatever their neighbours construct in their gardens. Also there is no law to say a neighbour is entitled to a view across his neighbours property. It may, this is usually due to a fault in TV or Radio receivers. In order to be immune to radio frequency interference, domestic equipment must be designed and produced to a standard. When this standard is not adhered to, equipment may succumb to nearby radio signals. Your broadband service provider is well equipped to locate sources of interference. They have powers that enable them to investigate and advise the owner of defective equipment interfering with their services. The may ask the owner to close down and or modify any sources of interference found operating near their users equipment. They should be the first port of call in any complaint involving broadband. The BBC are responsible for complaints about interference to TV and Radio. OFCOM provides a service and you can contact them or the BBC through their web portal here. Only where there is a planning or public safety issue. Local councils are not equipped or trained to deal with interference. You should approach the appropriate services and the council should direct you to them (see above). See questions related to planning below. You are in any sort of dispute with a neighbour. What if the council write to me about my antenna asking me to take it down or remove it? You are not obliged to take it down unless an enforcement notice is served and then you have a right to appeal against the enforcement. If you do receive an enforcement notice then See Page 82 of RADCOM March 2018 for an article entitled an Unexpected Visitor. (this link may not be available yet and is only available to radio amateurs who have registered with the RSGB). Initially you should enter into a constructive dialog about your development with the official concerned. If you have constructed a de-minimis or permitted development point that out to begin with. Is there a code of practice covering backyard antenna construction? Yes. See the March 2018 Edition of RADCOM at the link above for further details. Like everyone we are obliged to get on with our neighbours. But we aren’t obliged to put up with certain types of behaviour. The amateur radio code of practice is about maintaining friendly relations. This is the best situation of all because it creates an atmosphere of co-operation between neighbours. This is known as cohesion. What if my neighbour is behaving badly towards me or my family? If you think your neighbour is behaving badly you are entitled to take action. Certain behaviour can be persistent or unwanted such as trespass, criminal damage or excessive surveillance, and may themselves lead to further unwanted behaviour. This can be criminal behaviour under the freedom from harassment act et al. The Suzy Lamplugh Trust runs the National Stalking Helpline and can help you to decide how to tackle it. Who should I go to if I have a complaint about a radio antenna? Firstly find out if it legal or not by approaching the constructor. Although planning regulations may not explicitly say whether a particular type of antenna is permitted or not, the amateur constructor is subject to planning law, which allows permitted developments for example. The amateur radio code of practice covers planning regulations. Individual citizens are entitled to deal with complaints about them or their property. The complainer should first approach the neighbour with a view to rectifying any perceived problem. He or she should also think about mediation and gathering evidence about any perceived wrong doing before before taking a complaint to the council or reporting the object to the planning department. Where a complainer is anonymous, persistent, multiple, direct to an authority or comes from one or more neighbours it will be seen as anti social. In these circumstances the recipient may feel that it is persistent unwanted behaviour or stalking or harassment. At the outset, he or she will keep a log of all dates and timings, notes of any conversations and the outcomes and also retain all correspondence. There is a right to video or record the conversation for the record. They may. A number of domestic devices such as computers, network equipment (Wifi Routers, power line network extenders etc) LED Lights, Street lights and other electronic devices, if defective, will cause interference to an amateur radio station. OFCOM are the authority for tracking and dealing with interference from such devices, which are usually defective or sub-standard in their design or build. There is no evidence that Amateur Radio causes cancer or any other illness. Many amateur radio operators spend much of their lives working in professional and amateur communication and have subsequently been exposed to Radio Frequency (RF) Radiation for long periods of time. They also have lived to an old age. While direct exposure to high power radio signals can cause physical injury such as RF burns. Amateur radio is governed by health and safety instructions and safe power limits are set. Additionally Radio hams have to answer questions in an examination before being allowed to operate. They are also subject to inspection. CB’ers and PMR users are limited to very low transmitting power. Further reading: https://www.cancer.gov/about-cancer/causes-prevention/risk/radiation/cell-phones-fact-sheet which states that “Radio frequency (RF) energy, unlike ionizing radiation, does not cause DNA damage that can lead to cancer”. All emergency services people have personal radio sets and operate mobile sets from the car as well as carrying mobile phones. Wifi covers almost the entire country and their low power transmitters are installed in most houses. There are two mobile phones for every man woman and child in Great Britain and to support these there are transmitters located by several mobile phone companies in most urban areas, (that’s housing estates and town centres.) as well as hilltop sites. Citizens Band and Private Mobile Radio. There are less amateur radio transmitters than all of these services. http://www.nhs.uk/Conditions/PacemakerImplantation/Pages/riskpage.aspx is the NHS FAQ regarding Pacemakers. According to this, the chances of a problem with the pacemaker itself are low. Any signs and symptoms which you think are related to a pacemaker should be checked by a doctor straight away for a diagnosis. Radio amateurs have access to public liability insurance. There is a wealth of information about safety available to radio amateurs and training and support available via relevant experts when dealing with the physical construction of an antenna. Amateurs are allowed to construct supports under the terms of the town and country planning act, and sometimes these can look quite substantial. The constructor should always consult a builder and plan his supports according to standards. All of these topics including Health and Safety are covered in the syllabus of the amateur radio exams. Before raising any concerns to the authorities, please ask the owner about the individual design if you are interested in its safety aspects. An amateur should be able to show you documents relating to most aspects of his radio station including its design specification. It may. So may your house, high buildings or street furniture (lamp posts etc). Fortunately lightning strikes to amateur radio antenna are reasonably rare and precautions are available to protect equipment connected to the antenna. Even if the antenna is higher than the surrounding properties it does not necessarily follow that it will be hit before anything else in the area. In council housing or rented accommodation, non domestic radio antennas are sometimes classed as alterations to the building and need the permission of the landlord before being constructed. The landlord may wish the radio amateur to prove that they have planning permission or an exemption if it is available. For council tenants you may ask the council for a copy of their rules. See also RADCOM March 2018 an Unexpected Visitor. Fake News. Radio is a technical hobby. It requires study of the underlying theory behind it. There is an epidemic of fake news in the media, made famous by the US President Donald Trump. Usually this is designed to cause trouble by presenting unsubstantiated facts of dubious origin. Before responding to any sources of information it is best to consult an authoritative source before drawing any conclusions. Faulty or poorly designed equipment. In neighbouring properties, equipment often causes interference to the amateur radio service. If you are approached by or on behalf of an amateur radio service user they may ask you to help to test for sources of “noise” caused by defective equipment. This is usually quite simple and involves switching it off to help identify the source. If faulty or noisy equipment is identified during the test, they may ask you to repair or replace it or offer to help you to do so, by paying for the repair for example. Do I have to cooperate if I am asked to switch off offending equipment? You do. Under the wireless telegraphy act, it is an offence to interfere with radio and tv services and he may ask OFCOM to investigate it. They may serve an enforcement notice. The same process applicable to property developments in the UK. A summary can be found at the planning portal. While this is simplified for the general public, it is not complete. Planning requirements are actually set out in a document called the general permitted development order (GPDO). This sets out what are permitted developments and what are not. In the GPDO, where can I find the information needed to plan an Amateur Radio Antenna? You won’t. The section that covers amateur radio is Part 1 Schedule 2, class A and E. Class E covers free-standing masts, poles or antennas and Class A, if it is attached to the dwelling (and, therefore, counts as an ‘extension’ to it). According to the GPDO, Amateur radio antenna are treated as a development the same as a conservatory or extension or anything else. This is confusing as elsewhere in the GPDO it describes various antenna (Domestic TV, Radio and Microwave). Telecommunications has its own section etc. What common mistakes do neighbours, planning and housing officials make when dealing with hobby and amateur radio transmitting antennas? One common mistake is to assume because a specific type of radio transmitting antenna is not covered anywhere in the GPDO it is not allowed. What other documents are there? You will not find an amateur radio antenna described anywhere in the GPDO, but you will in an obsolescent guideline called PPG8 Telecommunications. In 2012 the National Planning Policy Framework came out and changed a number of things. Your area can be further limited by a local order in which case the council has further controls in place and you need to ask them. (You can find out online if you go through the pre-planning stages of applying for planning permission). Do radio amateurs need planning permission for everything? Amateur radio antennae fall into a number of classes; Permitted developments, temporary and de minimis solutions require no planning permission. When does an amateur need planning permission for an antenna? Planning permission is needed if a development exceeds the dimensions set out in the GPDO. SInce 2012 councils have been obliged to consult everyone in the community about their planning needs and Produce Local Plans. In reality councils are only just submitting local plans as of 2017. They may not have consulted local radio amateurs. This situation is not ideal. If you find yourself as a radio amateur subject to draconian measures by council officials, then read your planning authorities local plan. What is De-minimis and how does that relate to an amateur radio antenna? De minimis is a leagal term relating to simple things that any judge would throw out of court as being a waste of time and money to argue over. Simple developments such as wire and vertical antenna are covered in PPG8 and are also classed as de-minimis. Who can help me to determine whether and amateur radio antenna requires planning permission? Current Guidelines are published at the planning portal. You are allowed to decide from these guidelines whether planning permission is needed. Sadly at the portal, no guidance exists for Amateur Radio Antenna. They do however exist for TV and Radio Antenna of the domestic variety. The RSGB recommends they are the first stop when planning an antenna. They will advise what category various solutions fall into and if planning permission is needed. They have local resources who know local regulations and which are likely to be enforced. You may also make your own mind up as many people do however following the consultation process and the pre-planning process they recommend can help avoid challenging situations. A neighbour has challenged my radio antenna – what are their rights? No neighbour has the right to an unspoiled view across your property. If the neighbours challenge your chosen solution, then they will obviously report it to the planning department if they don’t speak to you first. (See mischievous complaints above). Should this happen, then you might be told to apply for planning permission if it doesn’t meet the criteria set out in the GPDO. Also if you put up a solution that does require planning permission and it has been up four years, planning will issue you a note to say you don’t need it. What can I do about mischievous complaints? Often an early sign that a neighbour is up to mischief are questions related to planning and your development. Some neighbours will openly watch your property for developments and measure them while you are not there. If the neighbour has let you know his feelings towards your antenna make sure when visited by any official that you mention you have a neighbour with some kind of grudge against your developments. Some councils have effective anti social behaviour policies that will prevent them from enforcement action if you are being harassed by a neighbour. Others don’t. Keep a harassment diary. Do I have a say in what developments are permitted in my area? Yes you do. Local Government must canvas people in the community when setting out local development plans. If you are an amateur, or CB’er or avid dog walker etc, this is an opportunity to make sure your views are heard and that our heritage is respected by the community. Only if its on their property. Check your deeds or contract. What you do on your property is your business but if it is rented you must seek your landlords permission. If you own the property you should obey or address any covenants (listed in the deeds). As part of the planning process you will have to canvass the neighbours for their views on any planning applications you submit. We think so, after all its a hobby and humour is part of enjoying your life. With thanks to Hatlo for this image from ca 1935 Radio amateurs have traditionally taken the blame for some very unusual things. Copyright: SDPlus 2017 and the Armando Martins Campaign. Not to be reproduced without permission of the author. This entry was posted in The Armando Martins Campaign, Uncategorized on March 17, 2017 by admin.